We launched Immersive Edge this weekend and celebrated at the after party last night. It's the Monday morning after. Well to start let's talk about Next Dimension Tales which is a brand new grid that quietly launched as part of Immersive Edge. We wanted a place that was not linked to any particular commercial or private grid, something that could stand on it's own as a common ground for the hypergrid community. This is a library for 3D stories. If you create one we would like to link it via a holographic scene or a gate back to your grid. If it is a story built by a multi-grid team we can make space to host some. This is a free service so finances will create limits to how many can be directly hosted. Future projects from our teams will be hosted here. Immersive Edge will remain here open to the public. 1) It must be a 3D story. 2) It must be a story: a clear beginning, middle, end. 3) If both the above are true, you get in touch with Nara Malone via FaceBook, G+ or inworld and let her know you'd like to place a story at Next Dimension Tales. 4) Don't be intimidated by the rules because I am notorious for not following them. I have a vision of a catalog region of floating books that rez a scene when you land on it. You would then walk through the scene as an introduction to the story and go through a teleporter into the book which may be hosted on another grid. I think of it as a library where you check into a book rather than check a book out. Ideas often shift and refine themselves as you start making them a reality, but that's where it stands for now. The tools we used to build Immersive Edge, the tools we use to control NPCs are all there. Other creators are already contacting us about including AI, making ebooks that contain portals into worlds, holodeck novels and so on. We will add to current resources as new methods are developed. 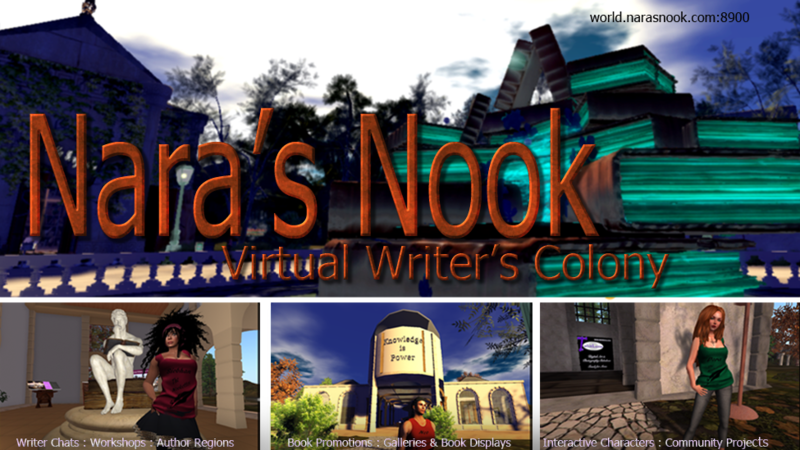 Nara's Nook Greyville Writer's Colony was created to explore the future of fiction in virtual reality and how virtual reality can continue to inspire better traditional text stories. The Immersive Edge project demonstrates that it takes more than a writer to tell a 3D story. It requires artists, scripters, musicians, etc. Fortunately our grid projects have been a gathering places for folks with these skills, sometimes those skills are all wrapped up in one person. Most Nook members have homes on other grids but come to Nook to join our experiments. Others enjoy making their homes with us. Either way, Nook is where the plotting and experimenting takes place and we welcome anyone who wants to explore the future of fiction with us. If you decide to join the Nook grid, please hold off until next week as we are in the process of moving to a new server and would lose any new members registering now.